This Christmas break Marisa and I decided to go Katy Perry style and do a little "hot" and "cold". For the "hot" portion we took a dreadful Ryan Air flight from Frankfurt down to Marrakesh, Morocco for a six-day tour of the Atlas mountains, the southern landscapes, the Sahara, and the cities of Marrakesh and Fez. Going off of a tip we got from a co-worker who just came from a 3-year stint of teaching in Morocco, we decided to hire a personal guide/driver for the week and we couldn't have been happier. If you're looking into a trip to Morocco I can highly recommend our guide, Mohamed: http://www.colours-of-morocco.com/ or his trip advisor reviews. He can pretty much put together a customized tour of any length and to any destinations in Morocco. 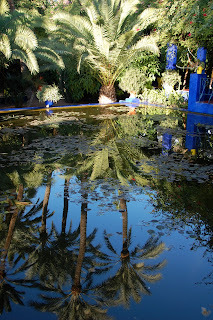 Our stay in Marrakesh was short as we groggily trekked around the city with a local guide and took in the sights of a place that was very foreign to most places that we've been. On the one hand it felt like Aladdin with tight streets, colorful markets, beautiful tile everywhere, snake charmers and monkey handlers present in the main squares. On the other hand it also seemed to resemble other developing countries: dusty streets, lots of mopeds, donkey-powered carts, lots of street food, hand-crafts being peddled, and harassing salesmen at markets. We never get tired of seeing the beautiful mosaic patterns found in different palaces, riads, kasbahs and mosques. This was in the Bahia Palace in Marrakesh. Bahia Palace - Even the cedar ceilings were beautifully recessed, carved, and adorned with this colorful mix of geometric shapes. In Muslim architecture (probably not the technical style) you typically see continuous patterns of geometric shapes or beautiful Arabic calligraphy since representations of objects, people, or animals is forbidden in certain buildings. Bahia Palace - Here we've got carved wall decorations that are usually out of cedar or plaster. 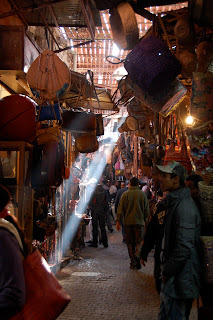 A glimpse of the crowded markets in Marrakesh. 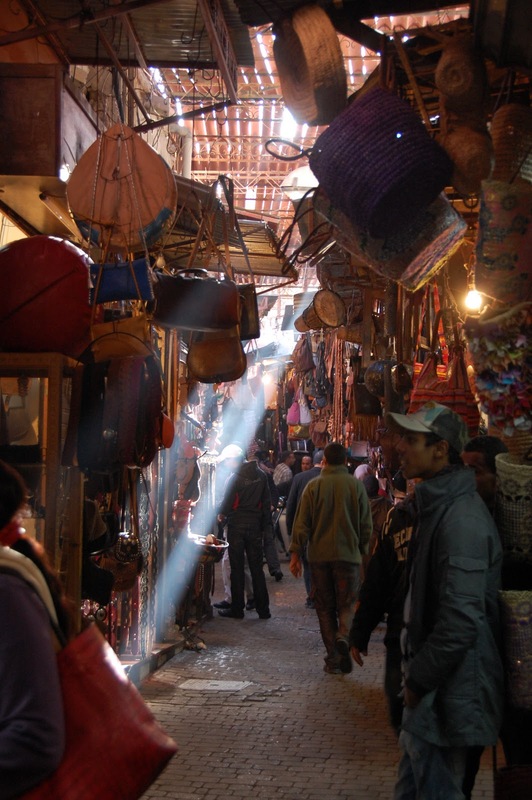 Moroccan hand crafts include lots of leather goods and metal goods such as lanterns and copper cookware as well as beautifully painted pottery. We only wish we had more time staying at this riad since the weather was so nice, the place so quiet, and the ambiance so perfect. Riads are basically old homes in the city that are huge and tend to be open in the center. It was amazing to come in off of the bustling streets into a real refuge. We had a nice little private dinner in the riad that featured three courses and a bottle of wine. We ordered in the morning, they did the shopping during the day and prepared it for whenever we wanted to eat at night. Afterwards the night duty staff person even started a fire in the fireplace and put on some bluegrass music - not sure how he knew because I wasn't wearing one piece of camouflage. Great start to the trip. On day two Mohamed picked us up and took us by the Majorelle Gardens on the way out of town. We drove south through the High Atlas mountains and stopped by a few interesting sites such as this kasbah of Pacha Glaoui. FYI a "kasbah" is basically either the large and fortified home of a wealthy person or a fort in general. This one is in serious disrepair, but it was really neat to walk through. 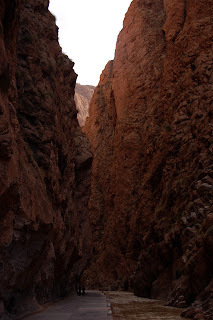 This gives you an idea of the windy roads that you go through while driving through the High Atlas mountains. 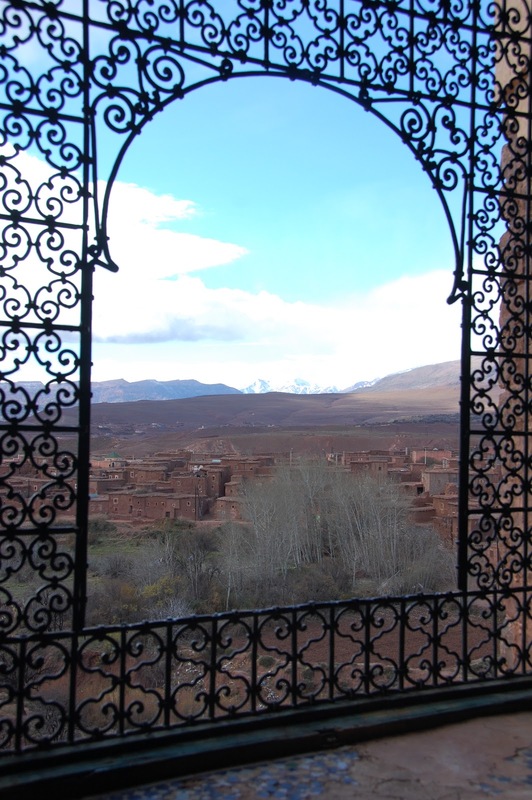 View from the kasbah of Pacha Glaoui near the village of Telouet. I love seeing the stark contrast throughout the landscapes in Morocco. Water is indeed necessary for life and it's amazing how clearly it can be seen. 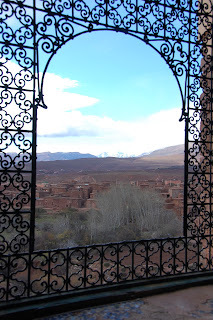 We continued on towards the city of Ourzazate, but stopped for lunch near the famous kasbah Ait Benhaddou, which has been used in many films such as "Lawrence of Arabia", "Prince of Persia", and "Gladiator". Our local guide, resembling Obi Wan Kenobi, made me feel like I was on a Star Wars set wearing his thick wool coat that is still in style here. Hoods like these went out of style a long time ago in the U.S.
A man can only handle so much mint tea before he has to slam "the real thing". Now's a great time to mention that Arabic is the official language in Morocco, followed by French due to its status as a colony until the 1950's. Mohamed took us for a little 4-wheel driving to mix up the monotony of the Moroccan highways on Day three. Lots of fun but apparently scary if it were to rain (flash floods). As you can see, no rain in our forecast for the whole week. We came across several "National Geographic" moments as we passed plenty of nomadic people with their sheep, goats, and camels in really remote locations. I really enjoyed this trip because we got to see a lot more of nature than we typically get to in European cities. This is a view from the Dades Gorge in the Atlas mountains. Our "cave-like" hotel room in Dades. After a few days of picturesque driving through the Atlas mountains we headed down towards the Sahara desert which is the topic of the next blog post!